As students from across the nation begin to take action towards their futures, the Alexander Graham Bell Association for the Deaf and Hard of Hearing (AG Bell) has begun accepting applications for its annual Leadership Opportunities for Teens (LOFT) program. This innovative program is helping deaf and hard of hearing teens who listen and talk to develop their leadership skills in building self-advocacy, teamwork, public speaking and self-confidence. The LOFT program now supports 40 teens in two sessions on June 26 – June 30, 2016 and July 5 – July 9, 2016 in Denver, Colorado. Through group leadership activities, and team building exercises these teens will develop newfound skills and explore and develop untapped talents. 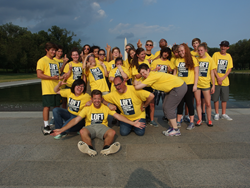 LOFT teens use the skills they gained at LOFT to advocate for themselves in high school, college and in their workplace and to change the public perception of what it means to be deaf or hard of hearing today. AG Bell makes LOFT financially accessible to families through the generosity of sponsors and donors. For those families who are challenged by the cost, AG Bell offers scholarships. Catharine McNally, AG Bell board member and LOFT counselor, stresses the importance of staying current with technological trends as a way to develop spoken language and provides tips and strategies to the teens to help them tap into the benefits of technology. Watch her YouTube video: https://www.youtube.com/watch?v=8C-pgxssm3I. Applications must be received by AG Bell by March 18, 2016. For more information, visit http://agbellloft.com/application-process/. For students that enroll in this camp, they are referred to affectionately as “LOFTees”. We encourage our students, parents and counselors to track and follow their experience on social media platforms by using the hashtag #LOFTEE. This way we can share this unique program and opportunity with others across the globe. Founded in 1890 by Dr. Alexander Graham Bell, a noted teacher of the deaf, scientist, and inventor, the Alexander Graham Bell Association for the Deaf and Hard of Hearing (AG Bell) is the world’s oldest and largest membership organization promoting the use of listening and spoken language by children and adults who are deaf and hard of hearing. The Alexander Graham Bell Association for the Deaf and Hard of Hearing (AG Bell) helps families, health care providers and education professionals understand childhood hearing loss and the importance of early diagnosis and intervention. Through advocacy, education and financial aid, AG Bell helps to ensure that every child and adult with hearing loss has the opportunity to listen, talk and thrive. With chapters located in the United States and a network of international affiliates, AG Bell supports its mission: Advancing Listening and Spoken Language for Individuals Who Are Deaf and Hard of Hearing. Visit http://www.agbell.org. For more information about AG Bell, please contact us at (202) 337-5220 or visit our website at http://www.agbell.org. For more information about the LOFT program, visit http://agbellloft.com/. .
LOFT Application - 2016 | Don't miss this unique opportunitySee here for application! !